Summer is here, and when you’re living in Tampa or Pasco County, Florida, that’s no joke. You don’t have to tell us that you’re used to dealing with heat all year, but we all know how punishing the sun is in summer specifically, and that’s why, at Benjamin Brothers, we strive to be the top authority in the area for air conditioning repair, installation, and maintenance. When your AC breaks down, it’s inconvenient at best and dangerous at worst. Nobody wants to be stuck in a hot, humid Florida home after their machine goes down, but it’s something that often ends up happening when they don’t care for their air conditioning system very well. Here are some mistakes you might be making with your air conditioner. These mistakes might be costing you money, hindering your system’s effectiveness, or both. 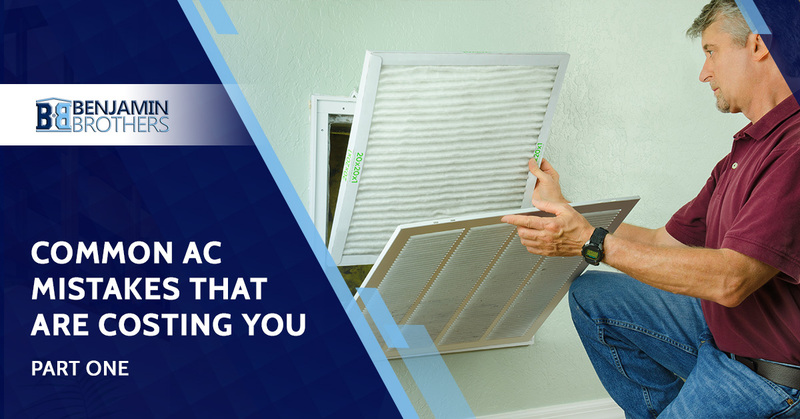 We mention the importance of changing your air filter every chance we get, and this blog is no exception. Change your air filter! It’s cheap, it’s easy, and it prevents all kinds of bad things from happening. A clogged filter will reduce air quality, make your system run harder, and reduce the longevity of your system. Read more here on how you can service your air filter. AC systems aren’t designed to run 24/7. An air conditioner that runs all day, every day is one that will not only cost you a fortune in utility bills, but it will also wear itself out faster and have a shorter lifespan. In reality, you only need a few minutes to cool your house down. Once you’ve run your AC for a little bit and you feel cooler, it’s good practice to turn it off, and only go back to it once you’ve warmed back up. Unlike fans, which provide an artificial sense of coolness through circulated air, AC systems actually reduce the temperature of the room, so it’ll take a little bit for it to climb back up before you need to run the air conditioner again. Similar to the point above, the air conditioner simply does not need to be run at night. Not only does this run your system for six to eight hours straight, it’s probably only having a marginal effect on the quality of your sleep. The body is able to tolerate warmer or cooler temperatures better when it’s asleep, so you probably don’t need the full might of your air conditioner to get the cooldown you need. Fans are perfect for night-time sleep. A fan next to an open window will funnel air from the outside into your room. Even if it’s hot outside, the circulation of the air will provide a cooling effect. This is much less costly than your air conditioner and it does just as well of a job. What do humans and air conditioners have in common? They both need to see the doctor from time to time. Indeed, AC units benefit greatly from regular visits from professionals. It’s good to get a checkup at least once every six months from professional HVAC contractors who have extensive experience in air conditioning installation and repair. If you happen to be in Tampa or Pasco County, our team at Benjamin Brothers can take a close look at your system and diagnose any problems. Ready to have a healthy AC unit that will carry you through the summer? Contact us today, and check out part two to see more air conditioning maintenance tips!